I’ve just been sent a link to the video they made at the Reading Room in Sofia – including my poem Rose Tattoo…You can watch it here. for what can’t be bought or sold, a faith in silence. Today they can’t help looking like an epitaph. ammonite and its tiniest flake of stolen moon. Back in the Botanic Garden, and of course it looks lovelier than ever because I am saying goodbye. I find myself making my ritual walk round, trying to imprint the experience of it in my memory to revisit when I am back in England. There are only two other visitors – a woman of about my age and what I presume is her granddaughter. She takes a photo of the smiling child in front of a fern in the glasshouse. One of the gardeners is sitting at a wrought iron table outside in the full afternoon sun reading the Saturday paper. I, on the other hand, quickly seek out the shade round the back by the rose garden – one of the whitewashed wooden benches, a soothing place to sit, despite the unavoidable whine of the traffic barely twenty metres beyond the cypresses marking the garden’s boundary. 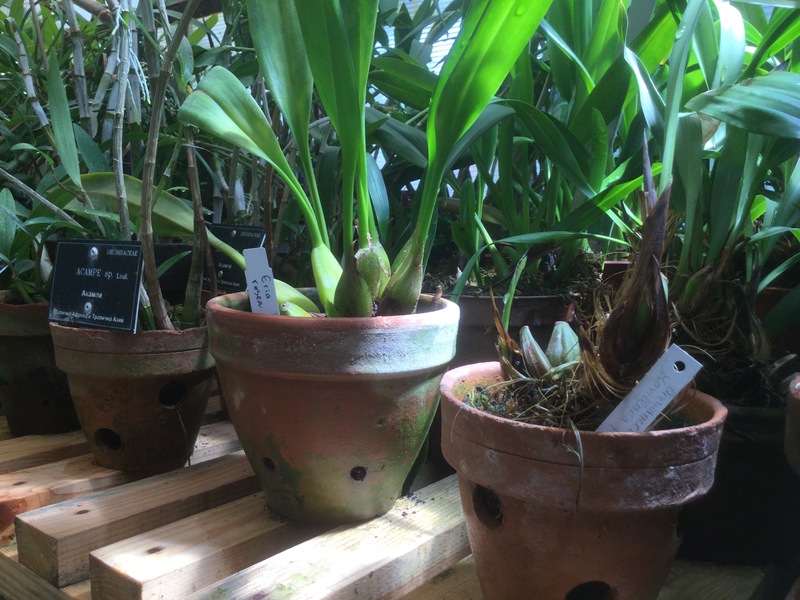 You enter this garden through a small flower shop, potent with the scent of lilies – cut flowers arranged in vases, highly confected bouquets, that the Bulgarians seem to love, plants in pots, for indoors and outdoors, lots of different papers and ribbons for wrapping. It is the custom to take flowers when you’re visiting – and always an odd number; even numbers only associated with death. 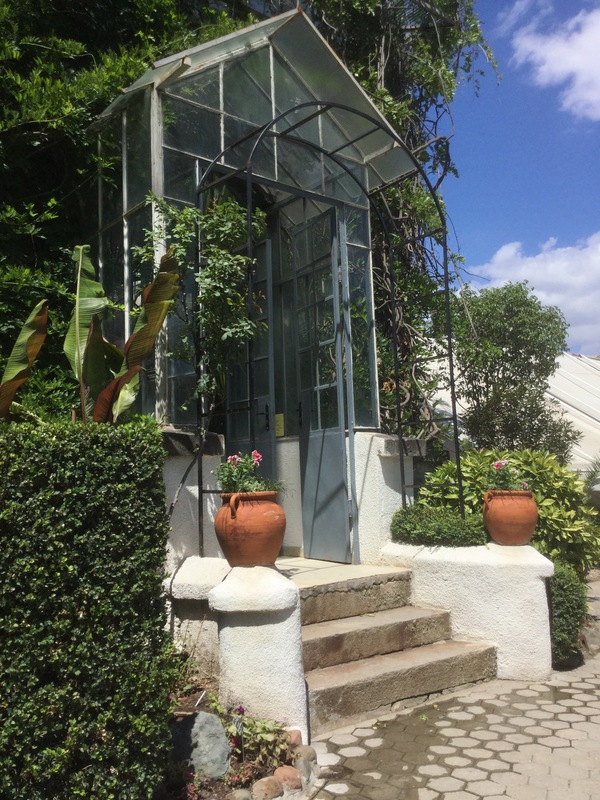 A door opens onto what they call the Greek garden – a little vignette of village life, panoramas of the timeless classical landscape and some ancient jars and marble fragments alongside southern plants, including a venerable specimen of a ‘European olive’. Every time I see a plant on this trip with Europaeus in its name I feel a pang of anger and sadness, already nostalgic for the continent I feel part of, at home in. After ‘Greece’, you enter Central and Southern America, the desert plants – cacti, succulents and palms. There’s also a small Tropical House with a constant fine mist fed by a flowing cascade and trough. Even though it’s still hot, the sight and sound of the water makes you feel cooler. 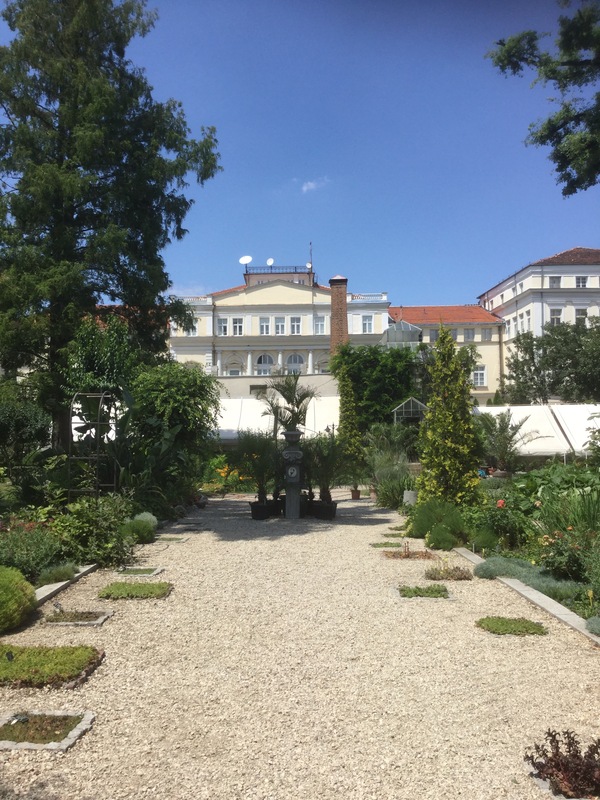 They are generally good with fountains here, large and small, part of their Austro-Hungarian heritage, scattered all over the city, particularly in the parks and gardens. Outside, pears are ripening above pots of purple basil. Since my first visit to the garden a month ago, various things have gone over. The lilies and day lilies that were so striking then have been replaced by dahlias and Japanese anemones. Though I think today the roses have truly come into their own, looking fuller and more beautiful than a fortnight ago. I’ve enjoyed this way our two countries are connected – through our national flower – despite all the differences between us, a sense of recognition and understanding, possibly thorny at times. Another of the gardeners (in the uniform of green dungarees and yellow shirt) is giving this part of the garden a good soaking – everything desperately thirsty. During this month there’s been only one day (an evening really) of rain. Otherwise it’s been in the high 20s and low 30s centigrade day and night. I have acclimatised mostly but sleep is sometimes troubled by the heat (and the mosquitoes, who took two weeks to notice I was here but, crikey, when they did, made a proper meal of me…). In the Rose Garden there’s a fragment of volcanic stone – an unusual flowing shape almost like a horse, legs hidden by the grass, as if it were swimming. I saw a lot more of this on the coast, often studded with lots of tiny fossils. It is used extensively in the hard landscaping at Balchik Palace and the Botanic Garden there. Bulgaria has very diverse geological formations – to match its biodiversity (and cultural diversity) generally. It’s the second most biologically diverse European country (after Spain) – a fact that many of the Bulgarians I speak to are unaware of. They shrug and look confused when I tell them, unfamiliar with feeling anything like pride for their native land. Last week I was interviewed on the National Radio about my Residency here with the Next Page Foundation’s Literature and Translation House. When the presenter (also passionate about plants, which I have to say is rare) asked how I found the country and Sofia in particular, I wasn’t entirely satisfied with my answer – along the lines of ‘unusual, exotic, contradictory, something Asiatic, something European and something else I can’t put my finger on…’ Afterwards however I was more interested in the simple fact of being asked; seeming to suggest Bulgarians are so unsure about their national identity, they need to hear it from someone else, an ‘outsider’. So many things here seem very aware of their own status as work in progress. Nothing is fixed, certain or reliable. I noticed something similar on my travels to gardens in Italy. Although this can at times be frustrating, there is a truthfulness in it. Everything is work in progress after all, isn’t it? Including us. Hence my difficulty pinning down any neat definition. Walking through the city to the garden this morning, I was struck by the accidental wabi sabi aesthetic of the place. Wabi sabi is what the Japanese call the quality of impermanence, unsatisfactoriness and insubstantiality of life as manifest in the physical world, natural and man-made and the fruitful place where they meet. Unlike in Japan, in Bulgaria they don’t set out to create such an aesthetic, but it happens anyway. Their history – of many different invasions and changes of regime – has been absorbed into their world view and natural philosophy. There’s a strong sense of the ad hoc, ingenuity in the moment, informed by a deep acceptance (or maybe sometimes deep resignation) at the way things are. Even though there’s a decadence to the appearance of things – architecture, streetscapes, even gardens – because of this outlook, there’s also an intense freshness, a childlike quality of innocence and openness. There is something consoling in this – a relief to let go of the whole goal-oriented, ‘grown-up’ perspective. And it also allows for the fact that if a thing (an idea, a poem, a garden) is never really finished then it can never really come to an end. It’s only later I discover that Sofia’s motto is ‘Always growing, never ageing.’ I ask my friend Nadya (Radulova – one of the city’s best poets and translators) if some people might think it’s more accurate the other way round – ‘Always ageing, never growing’. But she is adamant neither are true, the city is always just itself, eluding any neat phrase or defining formula. The work in progress continues. Sofia is a city of dramatic contrasts, history and geography under pressure from all quarters. It is sometimes confounding, sometimes beguiling. Now I’m back here after my time away on the coast, it’s strange to see how much it feels like ‘home’. Sofia Botanical Garden is the only one I’ve visited (so far) that is practically located on a roundabout. It’s hard to imagine – even when you’re actually there. But of course the result is it’s very far from being an oasis, the constant heckle of traffic impossible to ignore. However despite the whirlwind happening all around it, there is much to enjoy in this small but densely planted rectangle. I’m slowly getting to know its quirks and shady corners. Slow is the word…even the gardeners go very slowly to be able to work in the burning heat. 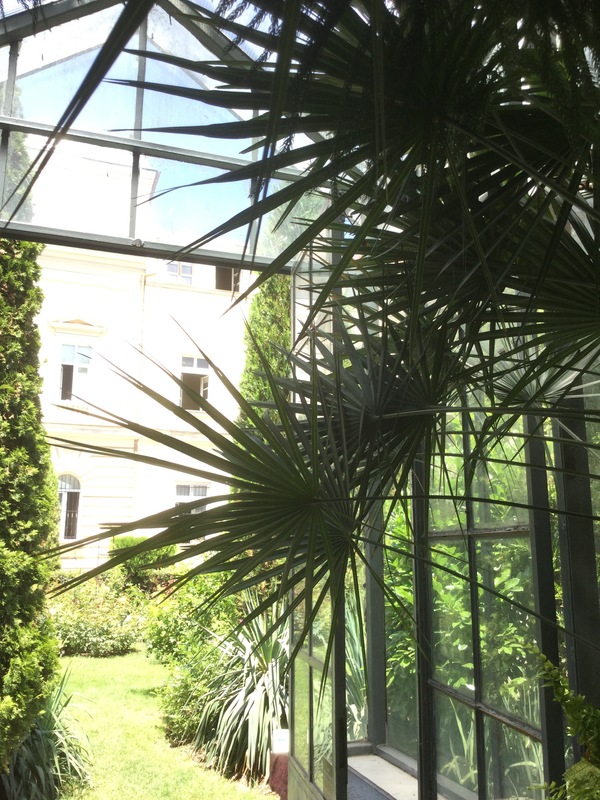 Sometimes it’s cooler inside the glasshouses. My poetry brain feels a bit like a battered coffee percolator on an old iron stove. On this day, 742 years ago, at Konya Rumi died. Here in Turkey they call him Mevlana – ‘our teacher’ – and celebrate today as his ‘wedding day’, when he became one with God.